This post was last updated on August 30, 2014 to include new images and a recipe video. Dustin and I have quickly fallen in love with this restaurant in Southwest Austin called Jack Allen’s Kitchen. They have an awesome restaurant design, menu and concept and their food is really great. They also have a Sunday buffet every week that is just amazing. 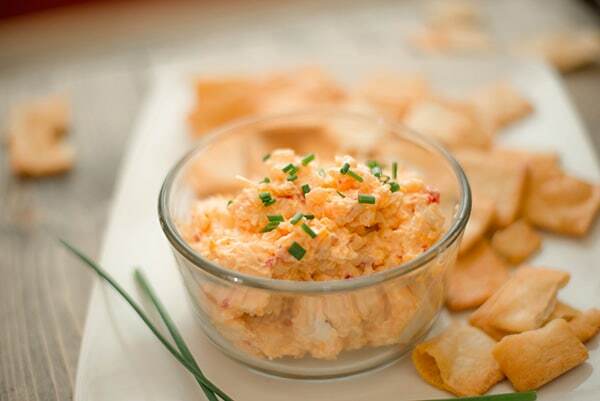 Our favorite appetizer at Jack Allen’s is their Homemade Pimento Cheese Spread with Crackers. It’s really tasty. And, when I say it’s our favorite appetizer, I mean it’s the only appetizer we’ve ever ordered there because we like it so much. I’ll admit, at first, I was skeptical to order anything pimento-related. Truth be told, it weirded me out a little. But, once I tried it, I was in love. I mean, c’mon: It’s a cheese spread, right? 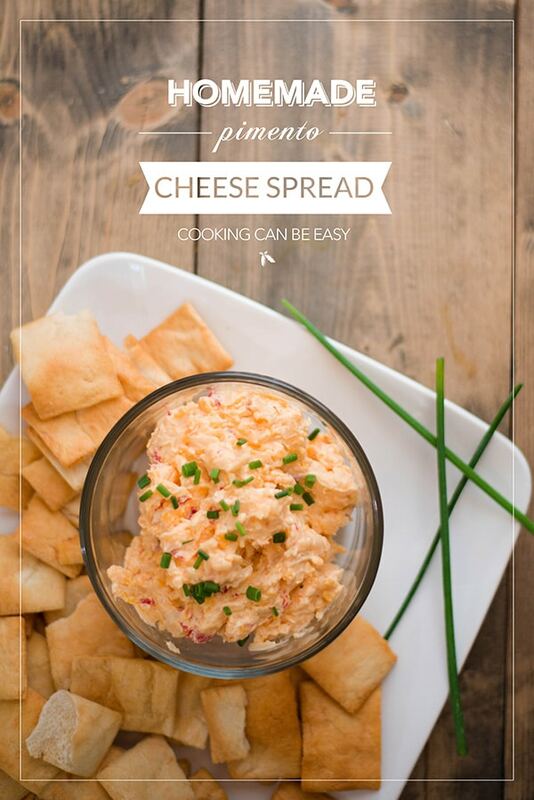 We decided it would be neat to make our own pimento cheese spread at home. Turns out it’s ridiculously easy. I also made some Olive Oil and Herb Crackers to go with it! 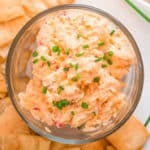 This is a super easy and yummy homemade pimento cheese spread recipe that is sure to impress and disappear quickly. In the bowl of a stand mixer (or by hand, electric mixer or food processor), beat the cream cheese until smooth. Add the remaining ingredients and continue to mix on medium speed until well combined. Wow! 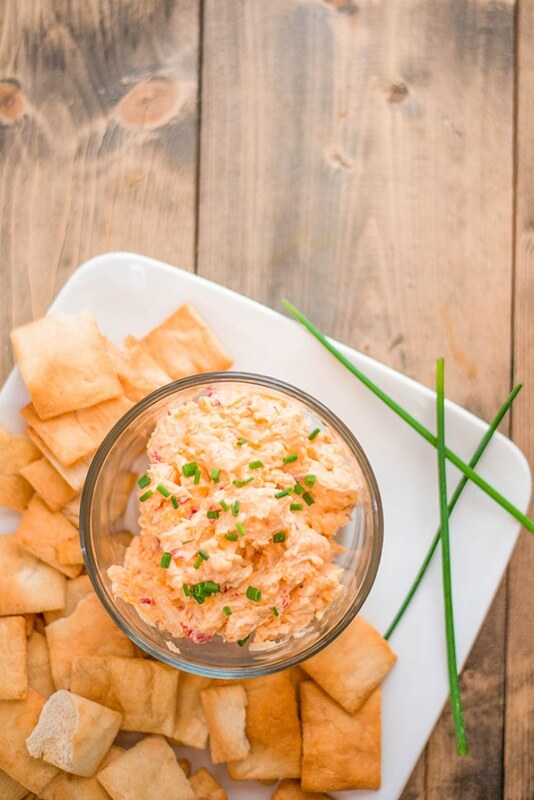 I’ve searched for pimento cheese recipes before, but yours hasn’t come up. Jack Allen’s was the site for our son’s rehearsal dinner, and this was on the tables for our gathering time — delicious! It looks like it’s been several years since the original post — if you are still stuck on the cheese spread, you really should break away just once to try their guac — a stand out in a town that provides many excellent guacs! We made this today very easy recipe and love the flavor. I tried it, except I swapped the cheese for a cheddar bacon cheese and added horseradish for a kick. the dip is great on pork rinds. Love the pimento cheese spread! I know the recipe states it makes 6 servings n=but could you tell me what the serving size is? Thanks! I will have to try this with vegan mayo, I have an egg allergy. I love the recipe! 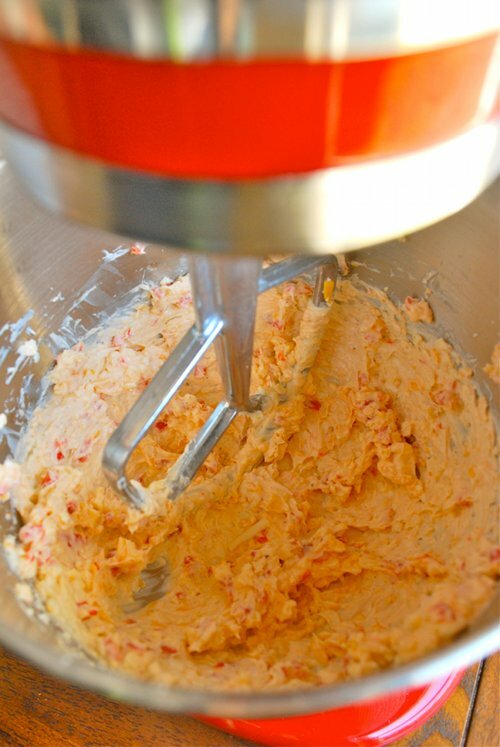 I followed the recipe as indicated…but I wanted to taste more pimento, so I used the full 4oz. Jar of pimentos I had bought, and added another 1/8 tsp of garlic salt. Perfect! This sounds so good! Thanks for sharing your tweaks – glad you enjoyed it! not that’s okay. I can tell by the ingredients which ones are okay. Thanks again. I do have a simple question please & super, pretty please help me out with this? I bought the diced pimentos, mayo, cream cheese but I didn’t grab monterrey jack cheeses or garlic powder:( I can run get any seasons I need but do I need to add monterrey jack or could I only use the extra sharp cheddar cheese I’ve already purchased? I’ll wait for your reply before I run back to the store:) thanks in advance (esp if you please can help) & I hope your holidays are wonderful☆☆☆☆ We love pimento cheese 🙂 well 3 of us out of 6 lol! Can’t wait to hear back!!! I’ll keep checking back or I’m on Pinterest also is totally up to you I totally appreciate you! Thanks & cannot wait, I wanna pimento cheese sandwich right now yummy!!!! Thanks a bunch! Beverly Patterson is my name on Pinterest, Facebook & Gmail is beverlykims@gmail.com thanks again! I wanna make this today if u have time. I’ll run to the store to get the garlic powder & maybe onion powder in a couple mins. Thanks a 3rd time, lol! Hi Beverly! The truth is that I’ve never tried this recipe with cheddar cheese. Being a sharp cheddar, I’d imagine it would take over a lot of the flavor, whereas the jack lays low. If you’re able to run to the store, the recipe as written is really the best. That being said, it’ll prob still be good with what you’re asking about, just not as good. Hope that helps! I’m at the store now & I’ll be purchasing the Monterey Jack cheese 🙂 thank you very much, I’ll let you know as soon as we try eat although I know it’ll be wonderful! I love pimento cheese thanks again! Great recipe. Came home wanting really good pimento cheese. This is really good. I love Jack Allen’s! And just like you was skeptical and LOVE the cheese spread. Went searching and found this http://www.twinliquors.com/whats_poppin/central-texas-chefs-corner-1 a profile of the chef and THE RECIPE!! I have made it several times. It makes ALOT! And odd- no pimentos. It uses red bell peppers. I just call it cheese spread because so many folks instantly turned up their noses at “pimento cheese”. I’ve eaten at that restaurant and yes it is delish!! Can’t wait to try this recipe!! I added a couple of dashes of hot sauce, and it was AWESOME! Thank you!! I made this today and – YUMMY! I added a little garlic powder and my family loves it! For myself I added red pepper flakes! All I can say is . . . . . YUM! It is sooo good! Thanks for this recipe–HEB also has a pimento spread that we enjoy, but I add chopped jalenpoes to give it a little dash of spice. Now, I can make our own spicy spread! This will be perfect for those holiday parties coming up this week.